I am a firm believer that we need to make planning as local as possible to communities because they’re best placed to know what will work. If developers ever contact me then I always tell them to consult as much as possible with the community – after all the people who are likely to buy their developments are going to probably like the area and therefore be pretty much like the people who already live there, so finding out what the community wants is actually the best way of making sure that when we get more housing and regeneration it actually works, is something people will want to move into, and that’s in everyone’s interest. Nationally, on the Conservative side we were against the recent Planning Bill that went through earlier this year, precisely because it took planning further away from local communities – its the one process that people do tend to get involved in. Though Ministers have had top down targets on housing I think the lessons from trying that approach have been that however badly we need to get more housing (and we do have an acute need), you can’t just ram through targets because it just sends a green light out to developers to max out their plots of land whatever the inappropriateness of the design and then communities and their councils vote down development anyway, so we’ve ended up much less new housing nationally than we could have with a planning process that allows communities to have their own debate and reach a more balanced view that works for them. We’ve got a further policy paper coming out with more ideas shortly, but running through a lot of what we’re saying is that people should be able to better decide for themselves. I hope that helps and I’ve no doubt Jane will be in touch! 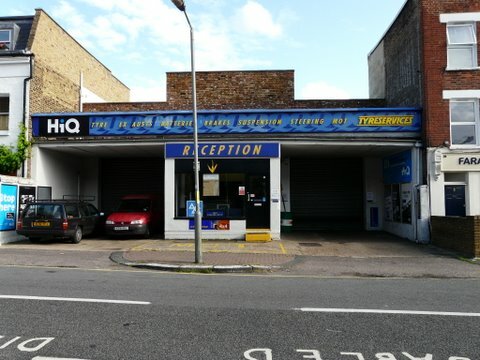 The Council has published the documents for redevelopment of the site called “HiQ Tyreservices” (76 – 80 Chatham Road SW11, off Northcote Road) involving demolition of existing commercial building and construction of 9 residential units, 4 with internal garages and three additional off street parking spaces and cycle parking and 1 retail unit (use class A1). The loss of HiQ TYRESERVICES in Chatham Road will be another nail in the coffin of a coherent local community with local facilities. This development is puny in comparison with the giant blocks we have been fighting against at Clapham Junction but still important. ‘HiQ Tyreservices’, is described by the applicants on the Council’s website as a ‘tyre warehouse’. In fact it is a large garage that does repairs and MOTs. It occupies a big ground area and it is not surprising that the owner of the site (the garage is leasehold) has put in a planning application for redeveloping the site, something the manager of the garage only found out about when he saw the yellow notice posted on the opposite lamppost ! I guess it is impossible to stop developers seeing every large space they set their sights on as a potential row of houses and a pot of gold, regardless of the usefulness of the business currently standing on it. It is money asking to be made. Buy the site, buy the lease. develop, sell … bank the money! Why don’t we all do it! The loss of a garage will be a serious blow to many local residents as there are fewer and fewer such facilities in the area. While it is impossible to stop such behaviour, the Council is in a position to make the incentive less remunerative than the developers would like. It could be that the sale of the garage lease to the site owner is not a done-deal and depends on how much money the developer stands to make IF given planning permission. The application is for 9 residential units AND a shop. 5×3 bed plus 4×2 bed units. The way the houses (units) are crammed in is a credit to the architect’s ingenuity. The proposal seems to me, and I hope will seem so to the Council, a preposterous overdevelopment. The façade of Tyreservices is three houses wide, but the ground area at the back is big (absolutely ideal for a local garage!). 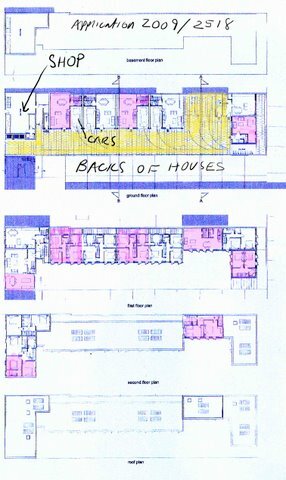 The planned units in a long row at the back seem to be based on the minimum legal requirement for the size of rooms, although the plans are not clear re- this. There are no gardens. The total of 7 parking spaces proposed (3 outside and 4 inside) are not likely to represent the needs of approx 23 new residents plus whatever needs the retail shop may generate. Hopefully the Council will reject this application. Anyone similarly minded please email : boroughplanner@wandsworth.gov.uk (more details HERE) re – application 2009/2518 as soon as possible. In view of the consultation on the new Local Development Framework (LDF) and the Core Strategy document (which sets out the the Council’s vision on the development of the borough for the next 15 years – more explanation here), we are working with the Battersea, Wandsworth and Putney Societies to submit a global comment on the “tall” building policy. As promised, we are displaying the following draft, and wish you to participate to the debate by leaving your view/comment (form at the bottom of the article). The final document will be officially submitted at the end of the month of August. The Wandsworth, Putney and Battersea Societies represent the northern half of the borough. We are responding to the Inspector’s concerns about Wandsworth Council’s “Tall” buildings policy IS3(d.
The Societies believe this policy to be fundamentally flawed and contradictory of other planning policies. We are opposed to it, and wish to see straightforward, clear statements of policy which determine a core strategy understood by the Council and prospective developers alike. A synopsis of the Societies’ views are as follows. “Tall” buildings, those significantly taller than their neighbourhood, must be considered in their urban context. Proposals for such buildings should not simply attempt to show that they do not harm matters of planning importance but that they contribute positively to the character, appearance and quality of the Borough and surrounding London hinterland. “Tall” buildings must stand up too to scrutiny in terms of need, appropriate location, architectural quality in their own right and their contribution to urban design. Wandsworth Borough is neither a city nor a commercial centre but largely urban and residential. We identify the following policy constraints by which Planning Permission for “Tall” buildings would be refused. TB5 Views and Open Spaces where a proposal will have an adverse effect (a) locally and (b) in a wider London context upon open spaces, views, historic buildings and their settings. Along with the above specific planning issues, the following matters which arise from the gist of Wandsworth Council’s “Tall” buildings policy and our knowledge and experience of the Council’s aims for the future of the Borough, also need consideration when drawing up a policy for “Tall” Buildings. ‘Landmark’, ‘signature’, ‘iconic’ or similarly described buildings should not be encouraged for their own sake, except in areas clearly identifiable as having opportunity and not in conflict with 1-5 above. Economics (aka Regeneration) should not be a planning factor determining the future of a site including such issues as site purchase costs. ii) that policies on Conservation Areas and the protection of Listed Buildings and their settings, townscape and the wider built environment should be reinforced. Whilst existing policies are sound and currently supported by Governments strategic objectives in PPG’s, they can be disregarded without arguments for doing so being subject to vigorous analysis. That is why, the Wandsworth, Putney and Battersea Societies require clear constraints to restrict “Tall” buildings as has been presented. 4.1 English Heritage and CABE’s ‘Guidance on tall buildings’ encourages local planning authorities to include specific policies for tall buildings in development plans clearly identifying, in map-based form, areas which are appropriate, sensitive or inappropriate for tall buildings (para. 2.4 and 2.6). The London Plan also states that boroughs may wish to identify defined areas of specific character that could be sensitive to tall buildings within their development plans (Policy 4B.9). 4.2 The London Plan indicates that boroughs should explain what aspects of local character tall buildings could affect and ‘not impose unsubstantiated borough-wide height restrictions’ (Policy 4B.9). Furthermore, English Heritage and CABE’s Guidance on tall buildings recommends that local authorities should carry out a detailed urban design study when assigning appropriate and inappropriate areas for tall buildings. The urban design study should identify the elements that create local character, such as streetscape, scale, height, urban grain, natural topography as well as significant views. a proactive assessment of where tall buildings could benefit the locality, improve sustainability and enhance the city image. 5.1 This supplementary planning document provides policy guidance on the planning and development of tall buildings within the Royal Borough. It is in direct response to the considerable importance placed by this Council, the Greater London Authority and central government on delivering sustainable development, and to the role that high quality design plays in a borough widely renowned for its superb historic built environment. Tall buildings represent only one model for high-density development. 5.2 It is not enough that tall building proposals demonstrate that they simply do not harm matters of planning importance, but that they contribute positively to the character, appearance and quality of the Royal Borough. They must stand up to scrutiny in terms of appropriate location, architectural quality in their own right and their contribution to urban design. Based on the sieve and proactive analyses, this document identifies six categories of area: three inappropriate, two highly sensitive and one possible area for the development of tall buildings. TB1 Within the Royal Borough’s conservation areas historic environment considerations are of such significance that tall buildings will normally be refused. TB5 In accordance with wider national and metropolitan guidance tall buildings should normally be refused within the strategic viewing corridor of King Henry’s Mound to St. Paul’s Cathedral. TB7 Outside the 400m (0.25mi) walkbands of major transport nodes, the development of tall buildings should generally be refused due to insufficient accessibility unless it is instrumental in bringing about significant public transport improvements. TB2 Tall buildings will normally be refused within the buffer zones surrounding conservation areas and at greater distances where the building would have an adverse effect on a focal or axial view from within a conservation area. TB6 New tall buildings will normally be refused within a landmark viewing corridor or a London panorama or river prospect backdrop. TB19 Areas around Latimer Road Station and Westbourne Park Station, along with gateway areas along the western border of the borough are designated as areas where tall buildings may be appropriate, subject to detailed planning and design considerations. Outside of these areas proposals for tall buildings will not be accepted. TB13 ‘Metropolitan landmarks’ should not be developed in the borough, since Kensington and Chelsea is a predominantly residential borough without opportunity areas as set out in the London Plan. TB18 Tall buildings should only be located where there is a strong argument for sustainability, accessibility and improvement of the city image. TB20 Tall buildings should be of outstanding architectural, sustainable and urban design qualities. Policy PL 14 (p78) “Putney – Developments are likely to be at a higher density than existing buildings” [including] “proposals for tall buildings“. Tileman House: Town planner recommends refusal. The proposal by reason of its height and scale would form an overbearing and unduly dominant feature uncharacteristic of the surrounding area and prevailing buildings heights, would have a detrimental impact on the streetscape, and would have an inappropriate relationship with adjoining properties contrary to UDP Policies GEN7, TBE1 and TBE5, Core Strategy Proposed Submission Policies PL4, PL14 and IS3 and London Plan policy 4B.10. The local planning authority has received inadequate housing viability information in order to assess if the proposed level of affordable housing in terms of the overall numbers, the mix of types and sizes and the split between social rented and intermediate has been maximised on this site in order to secure the Council’s affordable housing target. The proposal is therefore contrary to Core Strategy: submission version policy IS 5 and London Plan Policies 3A.9 and 3A.10. It remains to be seen whether the members of the Committee do or do not agree with the recommendations, but I think we can guess that the weight of public opinion has had some effect: On the Council’s website, there are currently 269 objections and …2 support letters! According to the planning officer report, we had 267 objections on the previous application withdrawn last year. 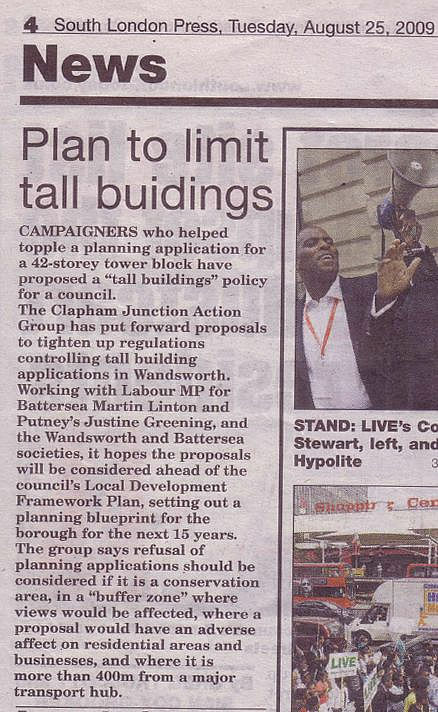 The Mayor of London raised also serious concerns about the height of the 15 storey element of the proposal.